Joan Collins posted a selfie of herself and British celebrities at the Prince's Trust Awards last night in a bid to recreate Ellen DeGeneres's famous Oscars photo. 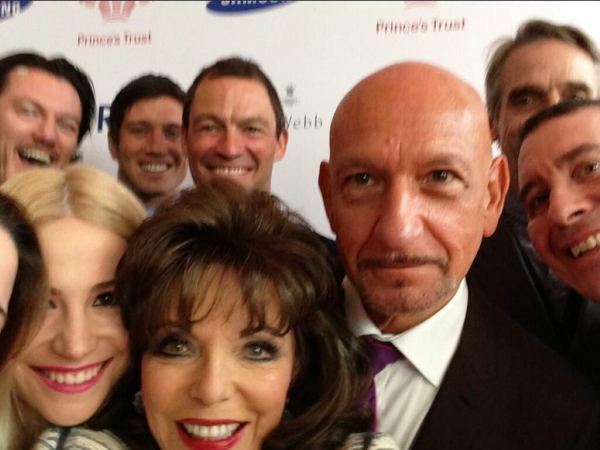 Joan Collins has recreated Ellen DeGeneres' Oscars 'selfie'. The 80-year-old actress gathered a group of British celebrities, including Sir Ben Kingsley and Jeremy Irons, together at the Prince's Trust and Samsung Celebrate Success Awards in London yesterday to recreate the famous snapshot, taken by Bradley Cooper on the talk-show host's phone at the Oscars ceremony earlier this month. The Dynasty actress managed to encourage a number of the other guests at the awards to get involved and the result was a rather blurry photograph of Joan, Ben and Jeremy joined by Pixie Lott, Vernon Kay, Jools Holland, Dominic West and Luke Evans. Meanwhile Vernon Kay's wife Tess Daly, sports broadcaster Gabby Logan, X Factor winner Sam Bailey and presenter Phillip Schofield missed out on being involved in the British version as Joan's arms couldn't stretch as far as the American Hustle stars did. Posing together at the 86th Academy Awards at the Dolby Theater in Los Angeles for the original 'selfie' were Ellen, - who was hosting the ceremony - Bradley, Julia Roberts, Jennifer Lawrence, Meryl Streep, Brad Pitt, Angelina Jolie, Kevin Spacey, Channing Tatum, 12 Years a Slave star Lupita Nyong'o and Jared Leto, who was unfortunately squeezed out of the shot. Joan has since posted her "selfie support" on Twitter in a bid to receive more retweets than Ellen's image - which broke records with over 3.2 million people retweeting the star studded photo - but so far it's only been re-posted by under three hundred social-media users.